Published: Dec. 30, 2014 at 05:17 p.m. Updated: Dec. 30, 2014 at 07:08 p.m. The 2014 season is in the books, and as you're inundated with articles about looking back and looking ahead, we decided to give you a little of both. Below are the top 30 scorers in fantasy football (standard scoring leagues), with a little recap of what they accomplished in 2014 as well as what could be in store for 2015. It looked like Andrew Luck was going to finish as the top-scoring fantasy player for months, but a late season fade paved the way for Rodgers to usurp him and take the crown. Rodgers had fewer yards and touchdowns than Luck, but more importantly he had 15 fewer turnovers which helped him edge out Luck by a mere 2.40 points. 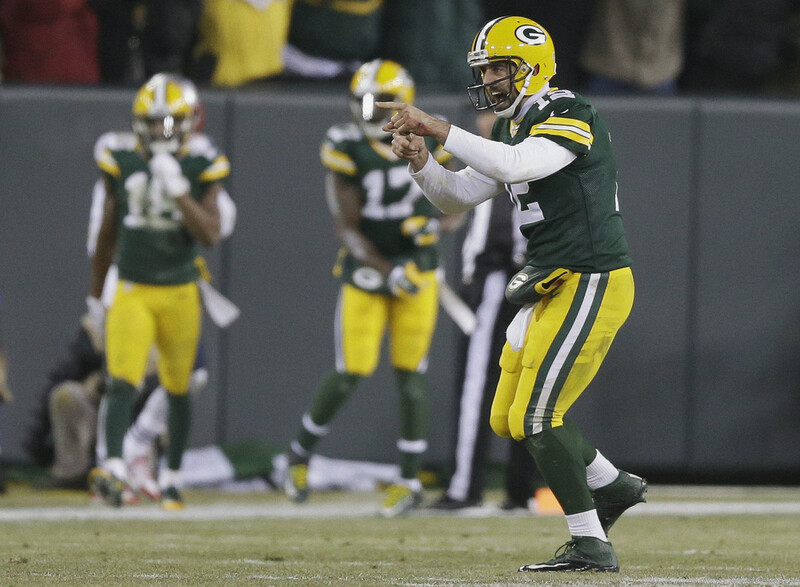 Rodgers will likely be the first quarterback taken (maybe in the first round) in 2015. Luck finished the season third in passing yards (4,761) and first in touchdown passes (40). He also added 273 rushing yards and three scores on the ground to help his cause. Luck likely would have locked up the top scoring position in fantasy were it not for a 0.36 performance in Week 16. Still, Luck has now cemented himself as a fantasy superstar and should be drafted as such in 2015. Wilson had a breakout fantasy season, largely due to the fact that he racked up 849 rushing yards and six rushing scores in 2014. His 3,475 passing yards and 20 touchdowns didn't hurt either. Wilson's dual-threat nature and smart play (fewer than 14 turnovers in every year) will make him a top QB draft target next year. Manning posted yet another remarkable statistical season, with 4,727 passing yards and 39 passing touchdowns. Manning scored 20 or more fantasy points in each of his first nine games, but a late season fade that saw him score 14 or fewer points in each of the last five games prevented him from finishing higher on this list. Manning's days as a one of fantasy's top signal-callers might be numbered. Despite a slow start to the season, Roethlisberger climbed back into the upper echelon of fantasy scorers thanks in large part to back-to-back 340-plus passing yard, six-touchdown games. He scored a total of 80.48 fantasy points in those two games, over 26 percent of his total fantasy points on the season. Roethlisberger could be a draft bargain next year, seeing as his rapport with his talented wideouts and offensive coordinator Todd Haley will only continue to grow in the offseason. Brees being so high on this list is really just a testament to how important the quarterback position is in football and fantasy. Brees managed to finish sixth overall in fantasy scoring, despite throwing fewer passing yards and touchdowns than any of his previous three years. Brees' stock might take a hit this offseason, but he's still a top-10 quarterback for 2015. What a season for Murray. He led the league in rushing yards (by a margin of 484 yards), and tied for the league lead in rushing touchdowns (13). Murray's future with the Cowboys is uncertain, as is his potential in 2015. Murray has had a fantastic season running behind one of the league's best offensive lines, but the history of backs repeating that kind of success after tremendous workloads isn't good. Never heard of the "Curse of 370"? It's time to get educated. Remember back in August when fantasy fans and pundits were concerned about Bell losing touches to LeGarrette Blount? Yeah ... about that. Blount was run out of town while Bell ran all over opposing defenses. Bell set the franchise record with 2,215 scrimmage yards and scored 11 total touchdowns. At just 22 years old, Bell will be a fantasy superstar for a long time, and the likely top pick in 2015 fantasy drafts. Ryan wasn't quite the superstar many were hoping for when they drafted him, as he threw one touchdown or fewer in eight games this season. However, he was pretty consistent in terms of his usual fantasy output thanks to nearly 4,700 passing yards and 28 passing touchdowns. If Ryan can get some more help on his offensive line, he could be a sleeper to crack the top-five fantasy scorers in 2015. Tannehill set career highs in completion percentage (66.4), passing yards (4,045), passing touchdowns (27) and rushing yards (311) en route to the first top-10 fantasy finish of his young career. Tannehill will be a trendy sleeper pick this offseason. There was a time earlier this season when people were saying Brady was done. Yeah, OK. All Brady needed was a little time to get things in order -- and a healthy Gronk. Brady isn't likely to lead the league in fantasy points again anytime soon, but he's a good bet to repeat his rock solid production in 2015. Talk about a bounce-back. Manning had one of his worst statistical seasons last year, but turned around this year to post the second highest passing yardage (4,410) and passing touchdown (30) totals of his career. Manning also cut his interception total almost in half from 2013 to 2014, but his real fantasy savior seems to have been Odell Beckham. It will be fun to watch what these two can do in a full season together next year. Romo has garnered some MVP buzz, and for good reason as he set career marks in completion percentage (69.9) and quarterback rating (113.2). He helped pilot the Cowboys to an NFC East title, and after a slow start, plenty of fantasy teams to playoff glory. He's once again a solid top-10 candidate at the quarterback position in 2015. Rivers started out the season with multiple touchdown passes in seven of his first eight games, but struggled down the stretch. Injuries to his offensive line and weapons hurt his overall performance, but Rivers can be trusted once again in 2015 as a QB1. Even though the writing seemed to be on the wall for Lynch's decline this season, we collectively wrote him off a bit too early. Lynch earned an increased role in the passing attack, which helped him score 17 total touchdowns. Beast Mode's status for 2015 is a bit uncertain with the Seahawks, but wherever he is fantasy owners should trust that he'll be rocking once again. Flacco finished the 2014 fantasy season as the 13th overall quarterback, as his first season with offensive coordinator Gary Kubiak was up and down. At this point it seems that Flacco is who we thought he was -- which is a solid QB2 but not one owners can trust with their fantasy futures in 2015. Oh boy, Jay. At times he looked like a fantasy MVP candidate, while for much of the season he was erratic and mistake prone. Still, he had six games with over 20 fantasy points, and whether or not he's in Chicago next year, fantasy owners can look to him as a QB2 with upside. Fantasy football's top scoring wide receiver was also its leader in receiving yards (1,698) and receptions (129). He's the top target in a high-octane offense and will be one of the first wideouts taken in 2015 fantasy drafts. Many thought this would be a true breakout year for Stafford, but he turned in eight fantasy performances with fewer than 15 points in 2014. He has all the talent in the world, and his production could have suffered with the injuries to Reggie Bush and Calvin Johnson for much of the season. Fantasy players should only look to Stafford as a QB2 in 2015. Kaepernick has the arm strength and legs to be a true difference maker in fantasy ... but he just hasn't quite been able to put it all together. He had five games with fewer than 200 passing yards in 2014 -- that's no bueno. Perhaps a new head coach/offensive coordinator combination in 2015 will be able to fully unlock Kap's potential. Keep an eye on him this offseason and heading into fantasy drafts. Oh, what could have been. Newton was never quite right in 2014, as he battled an ankle injury he had surgery on during the offseason, and then missed a game after being in a car accident late in the season. He finished strong, averaging 25.78 fantasy points per game during his final three starts. He could be a prime bounce-back candidate in 2015. Don't sleep on him in fantasy drafts. Forte set a new single-season record for receptions by a running back with 102 this season, and almost registered 1,000 yards rushing and receiving. He's a fantasy stud, and even his offense's struggles didn't keep him down too much. He's one of the few backs worthy of a first-round pick in 2015. When healthy, there are few backs more kind to fantasy owners than Foster. Case in point, despite missing almost four games (he was barely healthy when he played in Week 4), Foster still finished as the fifth-highest scoring fantasy running back. If he's healthy heading into 2015, he should be drafted in the first round as he was for so many years. Lacy had a seriously slow start to the season, but once the big guy got rolling there was little that could stop him -- on the field or in fantasy. Over the final eight weeks of the season Lacy averaged over 116 total yards and over one total touchdown per game. He's finished sixth in fantasy scoring among running backs in both of his pro seasons and remains worthy of a first-round pick in 2015. Nelson's game-changing ability as a wide receiver was the best kept secret in the NFL -- until 2014. Nelson caught 13 touchdown passes and racked up 1,519 receiving yards (a new Packers franchise record). He torched bad corner backs and could even score against the best. He's a lock as a WR1 in 2015. Thomas has now had more than 1,400 receiving yards and 10 receiving touchdowns in each of the last three season. That's as consistent as it gets in fantasy football. He's also a lock as a WR1 in 2015 and shouldn't escape the second round in any fantasy drafts. Bryant hasn't been far behind Thomas in terms of consistency, as he's posted better than 1,200 receiving yards and 12 receiving touchdowns in each of the last three years. He's one of the NFL's most talented pass-catchers and should be drafted as such come next August. Dalton finished as a top-five fantasy quarterback in 2013. 2014? The 18th-best. An increase in turnovers and serious decrease in passing touchdowns contributed to his decline. Fantasy owners would be best off to not stake their fantasy hopes on Dalton in 2015. Smith game-managed his way to become the 19th best fantasy quarterback, as his 3,265 passing yards and 18 passing touchdowns were nothing to write home to mom about, or turn your nose up at. He'll be a bye-week fill-in once again in 2015. Even though he battled various leg injuries throughout the season, Charles still finished as fantasy's seventh-best running back. The Chiefs offense could see an influx of talented playmakers this offseason (at least we hope they do), which would raise Charles' stock even higher if defenses don't have to focus solely on him anymore.